The video below shows Dr. McLaughlin repairing a large, acute rotator cuff repair. 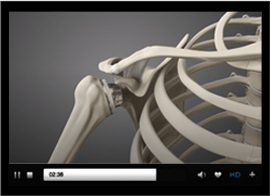 Please watch the multimedia presentation on rotator cuff repair prior to watching the video. It wll help immensely in understanding the contents of the video. Click here to view Multimedia presentation of Rotator Cuff Tear. This video demonstrates a simple rotator cuff repair perfomed by Dr. McLaughlin. Prior to watching this video please watch the multimedia presentation on rotator cuff repair by clicking on the multimedia link. This will explain in animated form how a rotator cuff is repaired and will help immensely in understanding what is happening in the video demonstration. The following video shows Dr. McLaughlin performing an arthrscopic knotless rotator cuff repair using the Knotilus Loop implant system. Dr McLaughlin brought the concept of a knotless rotator cuff repair to Stryker Corporation. Together they created the Knotilus Loop implant system. The video shows a knotless rotator cuff repair using the new system together with the reelx anchor.